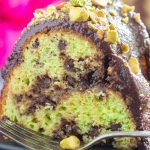 My Grandma’s Pistachio Bread recipe, madeover with a ton of chocolate, this Triple Chocolate Pistachio Bread features chocolate in the bread, chocolate chips in the cocoa-cinnamon streusel, and a chocolate ganache on top! This Triple Chocolate Pistachio Bread is also sweet, soft, moist, and now: crazy chocolatey! Today is HARD. My blogging friends would say that I’m “eating all my feelings today,” and that’s what I’m doing with this Triple Chocolate Pistachio Bread on this day. It’s a chocolate kind of day, and this Triple Chocolate Pistachio Bread is so cake-like and desserty that it will definitely console me. If you follow me on Instagram (you probably don’t because I don’t have a lot of followers there – haha), you’d have seen that we are fostering a litter of kittens. Today we must send them off to be with their next foster until they’re adopted out permanently. We’ve had a few adult cats, but this is our first litter of kittens (plus their Mom). I hate to see ANY of them go. I’m not looking forward to giving up these babies, but as they say in the fostering world: Goodbye is the goal. This is the inevitable next step in their lives, but it will be a difficult day. We intercepted them from the shelter at 3 weeks old, and saw them through an important stage of their lives: litter box training! They are messy little beasts. So freakin’ cute, but my goodness, such slobs. Adorable slobs. It was A LOT of work and cleaning. They’re just getting super active and lively! We made it through the literal sh*tstorm… through a difficult ‘hump’, and they’re getting to be playful and fun, and now we have to let them go. Not an easy day, but we’ll have to get used to this feeling if we’re going to keep doing this. We’re not excited to give up their Mom either, but she must go with the babies, of course. In the time we’ve had her, she’s put on weight and looks much more filled out. Her coat’s also improved, and it’s shinier and glossier. I wish we could see that through, and to get her to still better health, but I know she’ll be in good hands at her next home. Anyway, because of this, today is a chocolate kind of day. I took my Grandma’s Pistachio Bread and I made it over with chocolate. Lots o’ chocolate. Chocolate in the bread, chocolate chips in the cocoa-cinnamon streusel, and a chocolate ganache on top! 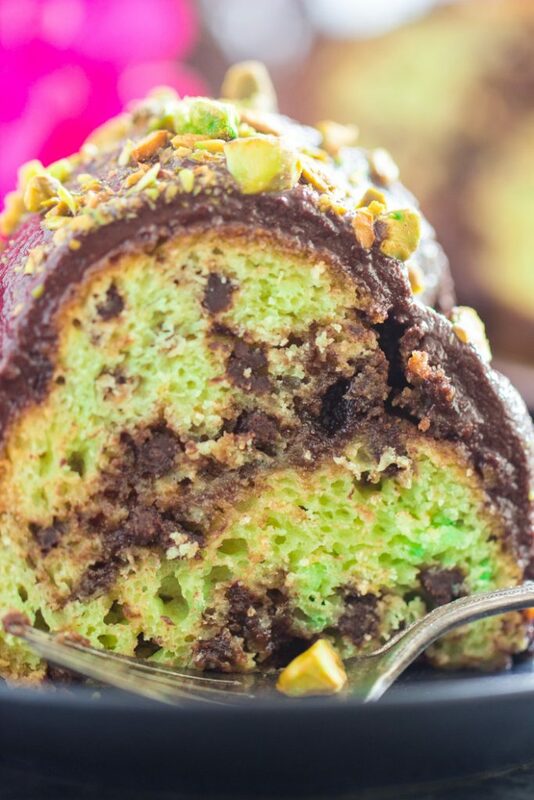 Grandma’s Pistachio Bread was an amazing canvas for adding chocolate! 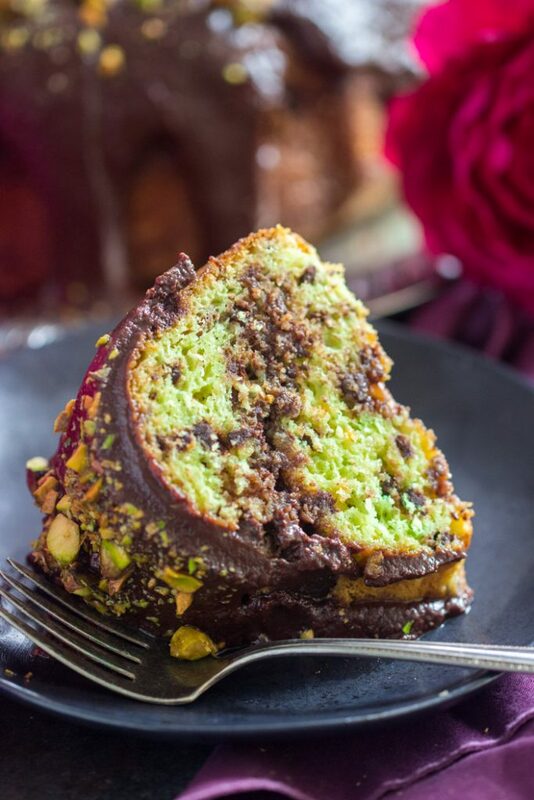 First of all, chocolate and pistachio together are a dream. 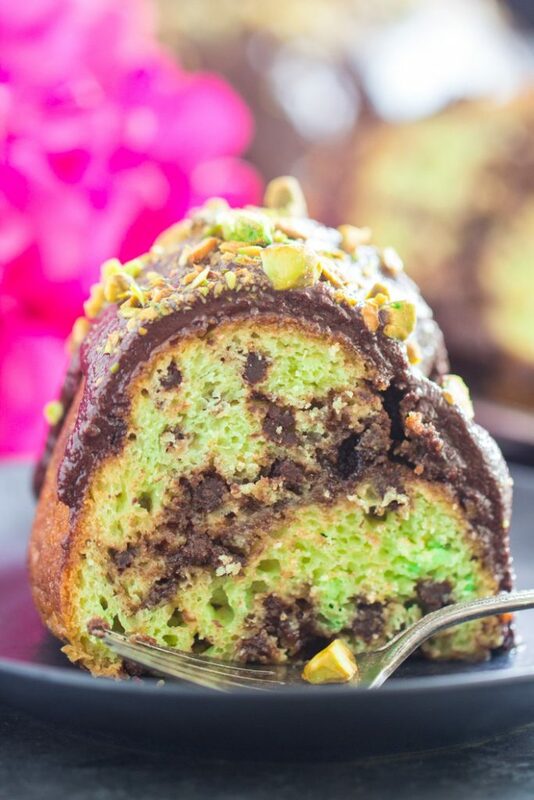 Then Grandma’s Pistachio Bread is such a sweet bread already, very soft and moist, almost cake-like, so adding chocolate just made it more desserty. 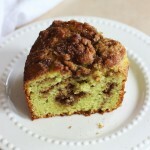 My very favorite piece of this Triple Chocolate Pistachio Bread is the streusel – sugar, brown sugar, cocoa powder, and mini chocolate chips, all melted together, a little crunchy, very sweet and chocolatey. 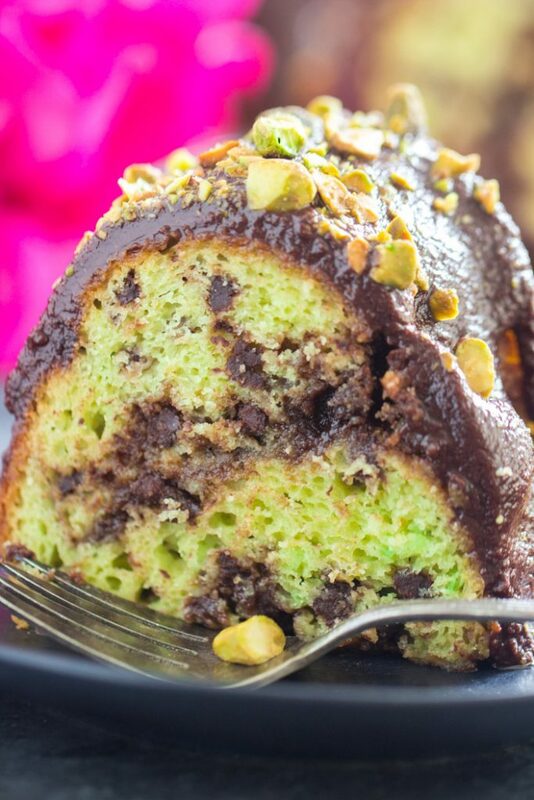 Definitely an instrumental element of this delicious Triple Chocolate Pistachio Bread. I was quite upset that I screwed up my ganache, and it seized!! I’d just poured it over the bread, so it was too late to fix. Grrrrr. It was still totally amazing. 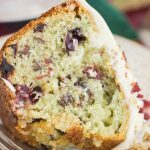 I have a whole slew of other fantastic pistachio recipes! 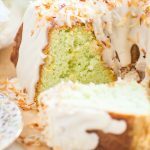 A few faves: these Pistachio Bread Cinnamon Streusel Muffins, this Coconut Pistachio Bundt Cake, this Amaretto Pistachio Cheesecake, these Pistachio Sugar Cookie Bars with Cream Cheese Frosting, and these Pistachio Pudding Cookies! Moist, soft, sweet pistachio bread, jam-packed with a TON of chocolate! Even chocolate streusel! In a large bowl, stir together cake mix, pudding mix, eggs, sour cream, oil, and 1 1/2 cups chocolate chips. Mixture will be thick! Spread half the batter into a well-greased tube pan or bundt pan. In a small bowl, whisk together granulated sugar, brown sugar, cocoa powder, and cinnamon. Sprinkle half the streusel mixture over the batter in the pan. Spread remaining batter into the pan. Sprinkle with remaining streusel mixture, and swirl lightly with a knife. Bake at 350 degrees for 40-50 minutes, or until edges are golden, and a toothpick inserted near the center comes out clean. Cool for 10 minutes, then run a knife around the edges to loosen bread, and invert onto a serving plate to cool completely. Do not cool bread completely in pan - it will stick! 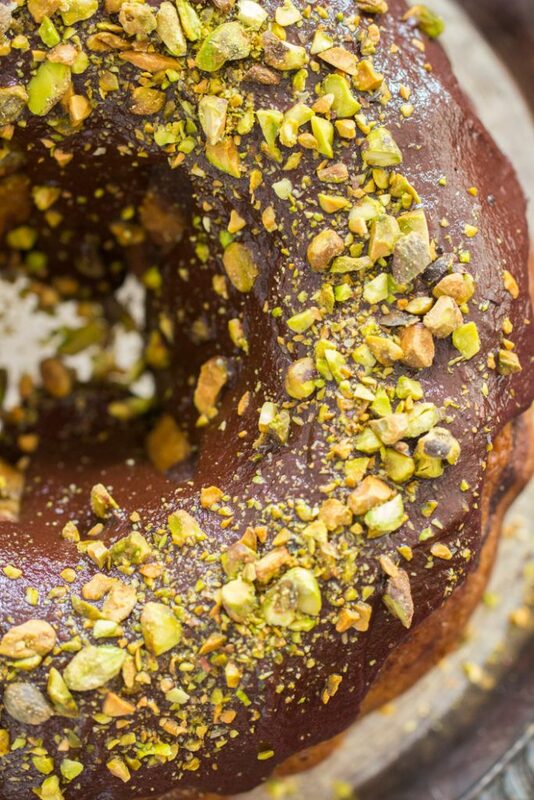 While bread cools, prepare ganache. Microwave on high for 20-second intervals until chocolate is melted and the mixture can be whisked smooth. Do not heat for longer intervals or the chocolate may scorch. Drizzle ganache over cooled bread, and sprinkle with remaining 1/2 cup mini semi-sweet chocolate chips, for garnish. Allow 10-15 minutes for ganache to set. Cut and serve. My dad would like this. 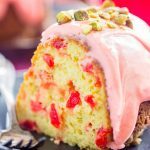 Where is the cinnamon mentioned in the recipe? How much is used in the streusel? Thank you. Hi! Omgosh, thank you so much for noticing that I forgot to add the cinnamon to the ingredient list! 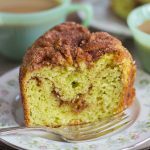 It’s just in the streusel – a teaspoon! I’ve corrected that. I’m so glad you noticed – thank you! This is a very awesome page i loved it the most. Oh wow. So glad I stumbled upon your site. I wasn’t looking for Chocolate and Carrots but wow!!! 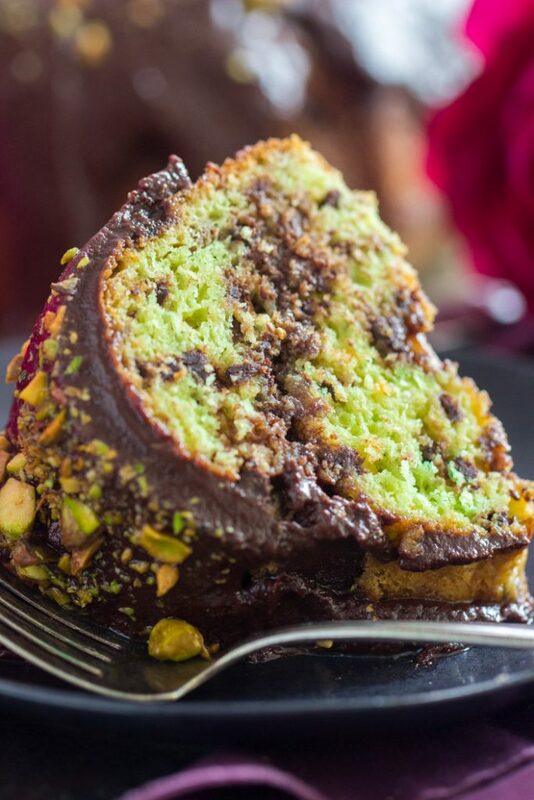 Can hardly wait to make it one of these days and now this…..Pistachio and Chocolate cake. Keep up the excellent work. There is so much on your site to to oooou and ahhh about.